Thalia and her teddy fell asleep on my lap as I read The Devil with Three Golden Hairs. I am nodding myself. Wilhelm sits in the corner of my study at the writing desk, composing a letter, he being more alive than the rest of us apparently. Thalia and I only got through the first third of the story. It started with a lad born with a caul. How do you delicately explain a caul to a child? I did my best by telling her to image a baby born with a piece of skin worn on his head like a little cap. She wrinkled her nose at that. Well she should. A caul is actually a portion of the birth membrane. The idea that the caul bears significance has a long history with references going back to Roman times. In the medieval period, in some places, being born with the caul meant good luck for those children, or that a destiny of greatness awaited them. In Eastern Europe the caul-children did not fare so well, destined as they were to become vampires. I have run across indications that the church burned caul-bearers as witches. Mostly though, owning a caul, even by purchase, was prized by sailors as a talisman against drowning well into the twentieth century. For our child in our story, the village fortune-teller declares that the boy, at the age of fourteen, will marry the king’s daughter. Upon hearing this, the king, in disguise, persuades the parents with promises and money to give him the child. The king throws the boy into the river, not knowing that the boy was rescued and raised by a childless miller and his wife. Fourteen years later the king happens to take shelter in the mill during a storm and hears the story of the foundling boy. Realizing who he is, the king asks to have the lad deliver a letter to the queen. 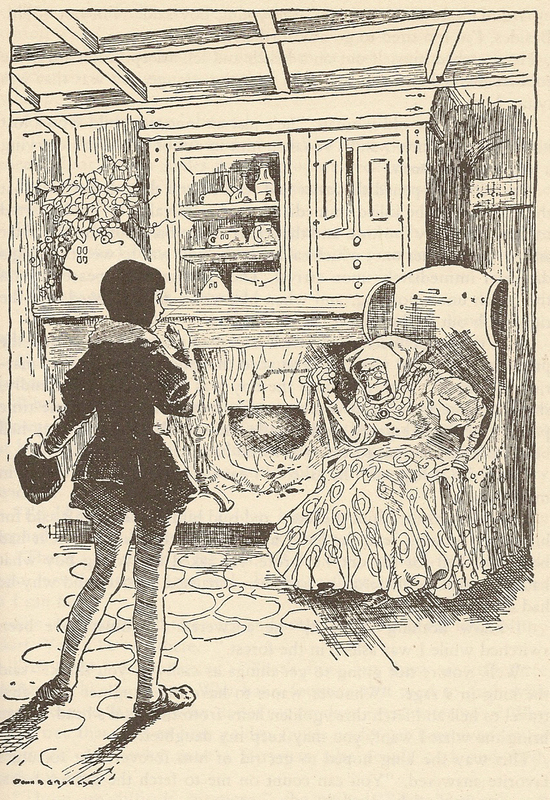 Up to this point, the story is remarkably similar to the English tale The Fish and the Ring with these notable exceptions: The talisman is a ring instead of a caul; the fortune-teller is the king himself; and the protagonist is female. Both tales contain the king’s failed attempt at infanticide, the child becoming a foundling, the king’s second attempt at murder through the device of a letter proscribing the child’s death, and the bearer of the letter falling in among thieves who rectify fate. I’d say more, but that is where Thalia, the teddy bear, and I fell asleep. I nodded awake to find Wilhelm gone, and a letter lying on the table in front of me, a letter addressed to Evald Tang Kristensen with no address or stamp. I knew what that meant. Another visit to Miss Cox’s garden. Two tulip shot glasses of Rǿd Aalborg Akvavit, awaiting my and Evald’s arrival, are set upon the wrought-iron table in front of its matching iron bench. The odor of caraway fills the still air around me. I see him entering at the gate, looking around. I note discomfort in his movements and expression. He never appeared to be at ease outside of his beloved Jutland. Even other parts of Denmark set him on edge. I’d done my homework on him. Born of peasant stock in 1843, he suffered much from neglect by his stepfather and by his mother’s preference for her new family. Rather a classic Cinderella motif with gender reversal. The thought that Wilhelm and Jacob also lost their father at an early age floats around in the back of my mind. Evald, being bright, rose above his peasant status to gain enough education to become a school teacher. In his early twenties, around the time of his first wife’s death (He married three times. ), he began collecting local folk songs. This soon blossomed into other areas of folklore. By his death in 1929 he had made record of 3,000 songs, 2,700 fairy tales, 2,500 jokes, plus numerous legends, sayings, poems, and riddles. His field notes alone took up 24,000 pages. His 79 publications comprised a sampling of his collection. Despite his monumental effort, he never gained much respect outside the admiration of fellow collectors. He did receive a state grant that allowed him to collect full time, and an eventual induction into the Order of Dannebrog (knighthood), but he struggled all his life against the upper-class intellectual’s downward glance at his peasant origins. My rising to greet him caught his eye. His countenance brightens. Communicating with a fellow collector puts him at ease and in his element. He sits beside me on the bench, translating aloud in his thick Danish accent. 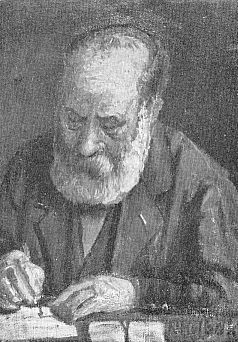 Wilhelm, after acknowledging Evald’s expertise, inquired if the motif of the purloined letter occurred in the Danish tales. Evald turns the paper over and explains his answer to me as he pens his reply. The motif did occur in the tale of King Wyvern, but unlike The Devil with the Three Golden Hairs, it was patterned after The Maid with No Hands. In King Wyvern, the queen, having saved her husband from a curse in part one of the story, bears him two boys while the king is absent. The letter sent with the good news is carried by the Red Knight, the stock villain of the Danish tales, a Loki-like character who sow seeds of discord. The Red Knight reads and alters the letter to say the queen has given birth to puppies. He does this with no other motivation than deviltry. In The Maid with No Hands the role is played by the devil himself to exact revenge. Evald refolds the letter and returns it to the envelope; then we toast with the shots of Akvavit, tossing them back in one gulp as is traditional. I return to my study, light-hearted for having met the notable Mr. Kristensen and light-headed from the Akvavit. PS. My thanks to Stephen Badman for his continuing translations of Evald Kristensen’s works, and his advice on things Danish. Thalia and I are well into The Devil with Three Golden Hairs, and will finish it this time. Fortune’s Favorite, as the story calls the caul-child, takes up the challenge. At the first city to which he comes, the watchman at the gate asks him his trade and what he knows. The next city has a tree that no longer bears golden apples nor even leaves. When the lad crosses a river, the ferryman wants to know why no one will relieve him from his task. 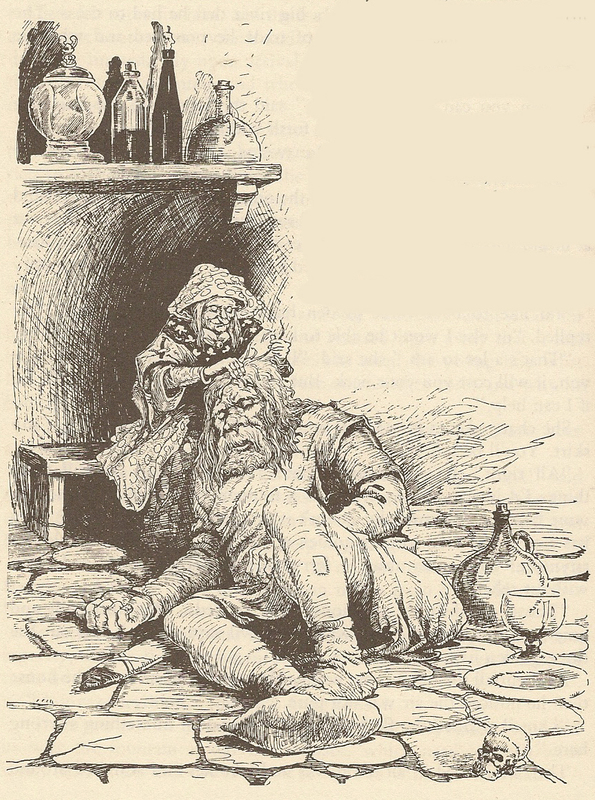 This part of the story I know as the Armenian folktale The Fool, in which a foolish man, while looking for his fortune has three questions posed to him. They lead to his fortune, but he does not recognize it, and bad fortune overtakes and actually eats him. Our lad enters hell after crossing the river (evoking thoughts of the river Stix and its ferryman, Charon), there finding the devil’s grandmother, who becomes his protector and aide. The parallel between her and the crone in the den of thieves jumps to mind. In the Christian tradition Satan is a fallen angel. In folk sensibilities the devil has a genealogy. The devil’s grandmother must be the oldest and ultimate crone. She hides Fortune’s Favorite by turning him into an ant that crawls into the folds of her skirt. The devil soon returns home. “I smell, I smell the flesh of a man.” He doesn’t have to say, “Fe, fi, fo, fum,” for us to recognize the start of this motif. The same sort of conversation happens in a lesser known Grimm tale, The Griffin, between the Griffin and his wife, while the lad hides under the bed. The grandmother quiets him down, feeds him; then he lays his head in her lap, and she delouses his hair as he falls asleep. Knowing the lad’s needs, she plucks one of the devil’s golden hairs and when he wakes up asks him for the answer to the first question. This happens three times, giving the lad his three hairs and three answers for his return trip. The two cities, grateful for the answers, give the boy considerable amounts of gold. The king, in his greed, asks his son-in-law where he got this wealth. The boy practices a bit of deceit, telling his father-in-law that gold is lying around on the far side of the river. The king rushes off, coming to the river and its ferryman. Previously, the lad told the ferryman what the devil had said. All he need do is hand the pole used to propel the raft to the next passenger. Thus the king is punished for his wickedness. Thalia smiles at this just punishment of the evil monarch. I reflect on the structure of this tale. The story came to the Grimms from Dorothea Viehmann, a produce seller. She grew up the daughter of an innkeeper, hearing tales told by patrons. I can’t help but wonder if The Devil with Three Golden Hairs was not her invention. The tale is an accretion of other stories assembled, I like to think, by a young girl working for her family in a tavern, never thinking her version would be preserved in writing for centuries to come.